The Ottawa Senators will look to continue stocking up prospects as they look to turn their fortunes around after their disappointing season. They have the fourth overall pick in the upcoming NHL Draft, but they also hold the 22nd overall pick that came over from the Pittsburgh Penguins in the Derick Brassard trade. Looking at the first-round draft patterns for the organization, the Senators have been conservative when picking European players in the first round. 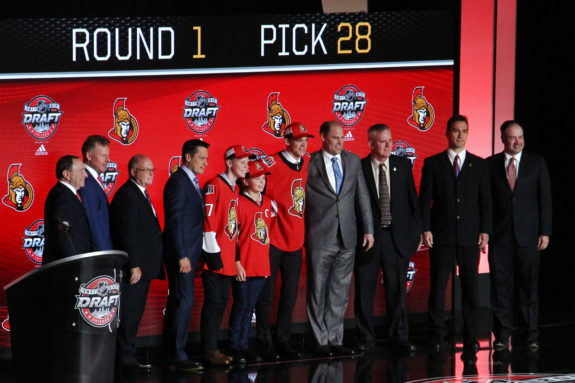 Over the last 10 years, the Senators have only drafted a European player with their first-round pick twice (Erik Karlsson and Mika Zibanejad). The Zibanejad draft has similarities to this one as well, with the Senators picking sixth, 21st, and 24th in the first round, selecting Stefan Noesen (American) and Matt Puempel (Canadian) after Zibanejad. In a draft that is relatively deep, the Senators have options on what to do with the 22nd overall pick. As Jacob Harris outlined the possible options for the fourth overall pick, lots of defensemen are available in the first round. 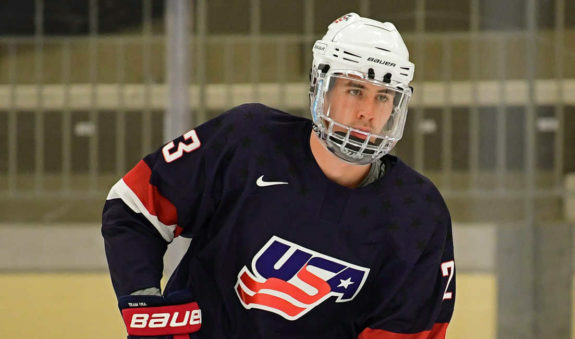 If the Senators do indeed go for a top defenseman like Quinn Hughes, Evan Bouchard, or Noah Dobson at number four, going with a forward at pick number 22 makes sense. 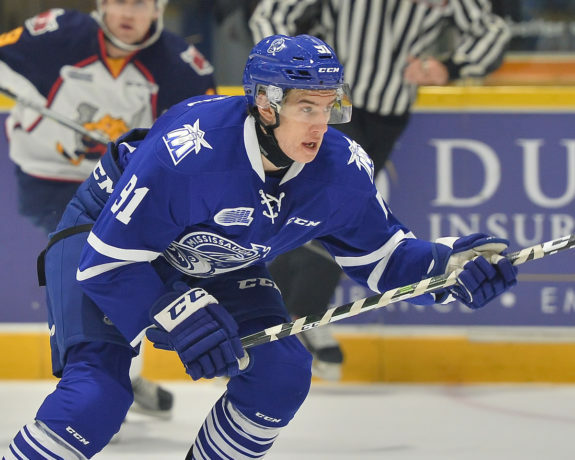 With centres Logan Brown and Drake Batherson developing with Windsor and Cape Breton the last few years, the Mississauga Steelheads’ Ryan McLeod can be a good fit to join the Senators’ prospect pool. The playmaking centre produced at above a point per game all season long, but that started back in the 2017 playoff run where he put up 20 points in 20 games. This season, his 44 assists in the regular season ranked him first on the Steelheads, one assist ahead of Golden Knights prospect and OHL Defenseman of the Year Nicolas Hague. Working on his skating and shot last summer, it showed in game action, as he scored 26 goals this season compared to his nine the season before. Jack McBain from the Toronto Jr. Canadiens is another big centre who can produce. Tallying 21 goals and 37 assists for 58 points, McBain uses his frame to his advantage while playing at both ends of the ice. Scott Wheeler of The Athletic has him ranked in the 22 spot in his final season ranking. “Were he a better skater, McBain would have everything you want in an NHL centre,” Wheeler said. “I’m confident after three or four years at Boston College, he’ll have a really good shot at making the jump.” (from “Wheeler: Final ranking for the 2018 NHL draft’s top 100 prospects”, The Athletic, May 8, 2018). Ryan McLeod of the Mississauga Steelheads. Photo by Terry Wilson / OHL Images. With the first round filled with possible NHL defensemen, why not stock up on D. This is more so if the Senators do opt first for the offensive talent in Brady Tkachuk, who TSN’s Bob McKenzie has ranked at number four on his draft rankings. Mattias Samuelsson from the U.S National U18 team would be an option and at 6-foot-4, 216 pounds he’s a solid consideration. The Hockey Writers’ Brett Slawson has him ranked 15th, but the overall consensus is he’ll be selected in the 20s or early in the third round. The Western Michigan commit had a stat line of 11-20-31 in 58 games last season. If all options are off the board, the Senators do have the benefit of knowing that there is a lot of talent in this draft, and trading down for extra picks in the later rounds can work in their favour. With the Senators in a situation where they want to rebuild but also not do not want to give the Colorado Avalanche a quality draft pick in the first round of next year’s draft, trading the 22nd overall pick this year for a current roster player could help them at least compete for a spot higher up in the Eastern Conference standings and allow their prospects to have another year of development.